Press Release (ePRNews.com) - PHOENIX - Jan 23, 2019 - Cheeriodicals is partnering with representatives from Andersen Corporation, America’s premier window and door manufacturer with headquarters in Bayport, Minnesota, to assemble and deliver 520 Big Green Boxes of Cheer for patients at the Phoenix VA Health Care System and the Miami VA Healthcare System through two January events. Two divisions of Andersen Corporation volunteered their time to assemble the Cheeriodicals gift boxes, which are filled with magazines, activity books, convenience items, puzzles and games to show thanks to the veterans for their service. Andersen Windows and Doors had more than 400 employees come together on Jan. 15 in Phoenix to assemble 320 thank you gift boxes for veterans. The next day, Jan. 16, a team of Andersen employees delivered the gift boxes to the hands of veterans at Phoenix VA Health Care System. On Jan. 27, another division of Andersen Corporation, Renewal by Andersen, will have a team of more than 200 employees participate in assembling 200 more Cheeriodicals gift boxes for the Miami VA Healthcare System. That same afternoon they will personally deliver all the boxes to veterans staying at the Miami VA Healthcare System. 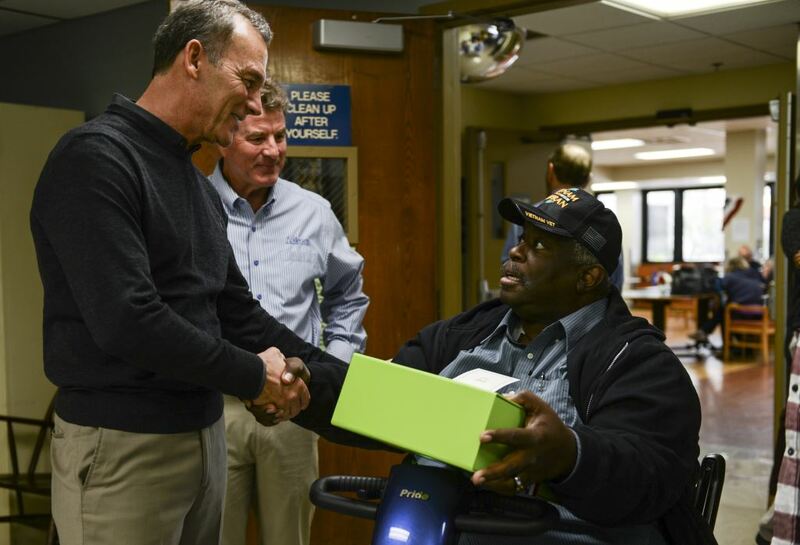 After special deliveries to the respective hospitals, free of charge, by Two Men and a Truck, the Andersen Corporation teams will have touched the lives of hundreds of veterans in Phoenix and Miami. Headquartered in Bayport, Minnesota, Andersen Corporation and its subsidiaries manufacture and market window and door products under the Andersen®, Renewal by Andersen®, EMCO®, Weiland®, MQ™ and Heritage™ brands. Andersen, a privately held company, was founded in 1903 and employs more than 8,000 people with manufacturing sites in North America and Europe. Andersen has earned the U.S. Environmental Protection Agency’s 2018 ENERGY STAR® Partner of the Year – Sustained Excellence Award. Visit us at andersencorporation.com. The Phoenix VA Health Care System proudly serves Veterans in central Arizona at the Carl T. Hayden VA Medical Center and nine community-based outpatient VA clinics. The Phoenix VA Health Care System is joining a growing number of VA health care facilities in adopting a new method of health care delivery called Patient Aligned Care Teams, or PACTs. This system is even more patient-centered and focuses heavily on quick and easy communication between patients and their health care providers. For more information, visit Phoenix.va.gov. The Miami VA Healthcare System serves Veterans in three South Florida counties: Miami-Dade, Broward and Monroe, with an estimated Veteran population of 149,704. Our parent facility, opened in 1968, is the Bruce W. Carter Department of Veterans Affairs Medical Center that is located on 26.3 acres in downtown Miami. The Miami VA Healthcare System is an accredited comprehensive medical provider, providing general medical, surgical, inpatient and outpatient mental health services. The Miami VA Healthcare System operates 372 hospital beds, including a four-story community living center attached to the main facility. The Miami VA is also responsible for two major satellite Outpatient Clinics located in Broward County and Key West, five Community Based Outpatient Clinics located in Homestead, Key Largo, Pembroke Pines, Hollywood and Deerfield Beach. For more information, visit Miami.va.gov. Cheeriodicals partners with children’s hospitals, Veterans Affairs facilities and other charities nationwide. They provide a one of a kind corporate team building experience focused on Corporate Social Responsibility. Cheeriodicals Team Building that Matters is a turnkey, meaningful celebration on a local and national level. They flawlessly execute an impactful, user-friendly event to unite a company while ultimately making a difference. For more information, visit Cheeriodicals.com.